Polypropylene random copolymer is a thermoplastic polymer that can be readily formed by catalytic polymerization of propylene using ethylene as a co-monomer at random concentrations to improve thermal and mechanical properties of polypropylene. Polypropylene random copolymer possesses beneficial properties such as excellent surface hardness, high impact and chemical resistance, good transparency, high heat resistance, and low melting temperature. Hence, it has gradually replaced other polyolefins in various applications in the last decade and the trend is expected to continue during the forecast period. Rising demand for food containers is likely to augment the global polypropylene random copolymer market in the next few years. Additionally, rising consumption of syringes for injectable drugs is expected to boost the polypropylene random copolymer market during the forecast period. However, stiff competition from available substitutes and volatile raw material prices are projected to hamper growth of the market during the forecast period. The beverage industry is likely to offer large opportunities for polypropylene random copolymer manufacturers from 2015 to 2023. Polypropylene random copolymer is likely to replace glass due to its lightweight and transparency. The packaging industry has been the largest consumer of polypropylene random copolymer. Unique properties of polypropylene random copolymer such as transparency, stiffness, organoleptic, sealability, and heat resistance make it one of the most efficient materials for food & beverage packaging. Polypropylene random copolymer is primarily used in food & storage container packaging on a large scale. The health care industry is the next biggest consumer of polypropylene random copolymer, especially in syringes, labware, and bottles. Large multinational companies have launched special grades of polypropylene random copolymer for medical applications. It is predominantly used in hot and cold water pipes in the construction industry. Polypropylene random copolymer is also used in hot & cold water pipes, VCD cases, toys, gearboxes, etc. Polypropylene random copolymer is also used in the production of specimen cups, syrup bottles, IV bags, pouches, and tubes. Other end-users of polypropylene random copolymer include media packaging, toys, sports, furniture, automotive, and household appliances. In terms of volume, Asia Pacific accounted for the largest share of the global polypropylene random copolymer market, accounting for approximately 50% share in 2014. The polypropylene random copolymer market is expected to expand significantly in China, India, Brazil, and ASEAN due to increasing demand for food containers in these countries. The market in Latin America is likely to expand at a significant rate due to rising demand in the food & beverage and medical industries. North America and Europe are mature markets for polypropylene random copolymer and are estimated to lose market share by 2023. However, moderate demand for polypropylene random copolymer is anticipated in the health care and building & construction industries during the forecast period. The global polypropylene random copolymer market is highly fragmented. 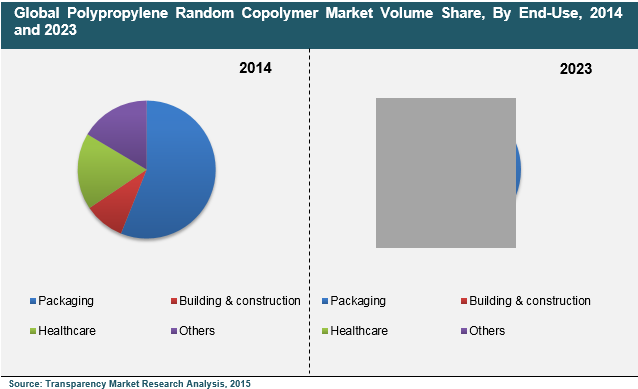 The top five companies accounted for nearly 30% share of the polypropylene random copolymer market in 2014. Most players in the market are vertically integrated. Several manufacturers focus on adding new features to their current products in order to gain competitive advantage and sustain in the market. Key players in the market include LyondellBasell Industries N.V., Total Petrochemicals & Refining USA, Inc., Braskem, SABIC, Sinopec, Borealis AG, Reliance Industries Limited, Formosa Plastics Corporation, Sasol, INEOS Olefins & Polymers USA, Pinnacle Polymers LLC, Entec Polymers, Flint Hills Resources, and Exxon Mobil Corporation. Rising demand from packaging and healthcare industries coupled with technological developments are expected to drive the polypropylene random copolymer market between 2015 and 2023. Polypropylene random copolymer is primarily used in the manufacture of food containers due to high heat and impact resistance, flexibility, and excellent transparency. Furthermore, capacity additions in the Middle East and China are anticipated to boost the market growth. There is significant demand for food containers in Asia Pacific due to changing lifestyle and shift toward processed and packaged food However, availability of substitutes such as polyethylene, polystyrene, polycarbonate, polyethylene terephthalate, and other polyolefins is anticipated to hamper growth of the global polypropylene random copolymer market during the forecast period. The beverages industry is likely to offer large opportunities for polypropylene random copolymer manufacturers from 2015 to 2023. This report provides in-depth analysis of the global polypropylene random copolymer market in terms of volume (kilo tons) and revenue (US$ Mn) from 2010 to 2023. The market has been forecasted between 2015 and 2023, considering 2014 as the base year. The study also includes drivers and restraints of the market and upcoming opportunities during the forecast period. The study provides detailed value chain analysis in order to determine value addition at each stage of the polypropylene random copolymer value chain. The report encompasses market attractiveness analysis and company market share analysis to provide a comprehensive view of the market. The report analyzes the overall competition in the market through Porter’s Five Forces Model to study the impact of buyers, suppliers, new entrants, degree of competition, and substitutes. The report includes global average price trend analysis of polypropylene random copolymer from 2010 to 2023. The study also comprises the global production of polypropylene random copolymer in 2014. The market has been segmented on the basis of end-user industries of polypropylene random copolymer, i.e., packaging, building & construction, healthcare, and others. Major regions considered in the report include North America, Europe, Asia Pacific, Latin America, and the Middle East & Africa. Each of these regions has been further analyzed on country level based on end-use demand for polypropylene random copolymer from 2010 to 2023. The market numbers in the report have been derived based on demand for polypropylene random copolymer in various end-user industries across all regions. Secondary research sources referred to include company websites, annual reports, broker reports, investor presentations, financial reports, and SEC filings. In-depth interviews and discussions with a wide range of key industry participants and opinion leaders were conducted to compile this research report. Primary research represents bulk of research efforts, supplemented by extensive secondary research. Key players’ product literature, annual reports, press releases, and relevant documents were reviewed for competitive analysis and market understanding. Major sources referred for this study include ICIS, FDA, Platts Magazine, Scottish Plastics and Rubber Association, and Plastemart Magazine. These helped validate and strengthen secondary research findings. Primary research further developed the analysis team’s expertise and market understanding. Top-down and bottom-up approaches were used to estimate the global polypropylene random copolymer market from 2010 to 2023. The report also provides key primary findings of the global polypropylene random copolymer market. The report comprises profiles of key players operating in the global polypropylene random copolymer market. These profiles include company overview, product portfolio, business strategies, and recent developments such as acquisitions, mergers, expansion, or product launch. Top companies included in the report are Braskem, Formosa Plastics Corporation, Pinnacle Polymers LLC, Reliance Industries Limited, Sasol, Total Petrochemicals & Refining USA, Inc., INEOS Olefins & Polymers USA, Entec Polymers, Flint Hills Resources, and LyondellBasell Industries N.V.